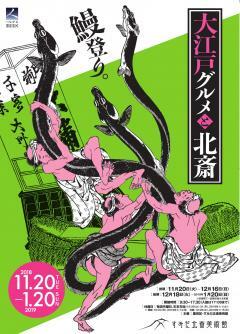 This is a page about Hokusai and the gourmets of Great Edo for the Sumida Hokusai Museum. Our Hokusai and the Gourmets of Great Edo exhibition is being held just five years after Washoku, the traditional dietary culture of the Japanese, was recognized as a UNESCO Intangible Cultural Heritage. The act of eating can be seen as a biological necessity for sustaining life. As a cultural activity, however, the nature of eating, of food and cuisine, reveals the distinctive qualities of each society. For Washoku, those characteristics include respecting the flavors intrinsic to ingredients and valuing seasonal differences. Japan’s food culture is, as its UNESCO status signifies, attracting intense interest from throughout the world. The roots of that Washoku culture line in the Edo period. During two and a half centuries of peace, agriculture and fishing made great strides, the economy grew and became more complex, and, thanks to socio-economic advancement, people achieved a level of affluence that enabled them to enjoy dining as a source of pleasure. The Edo gourmet was born. Even Katsushika Hokusai, who was dedicatedly focused on his art throughout his long life, is known to have enjoyed eating sweets. Hokusai also created lively depictions of foods in Edo and of people enjoying eating them. The exhibition is organized, in fact, with the flow of food, from farm and ocean to table, in mind. We hope you’ll enjoy every morsel of this Great Edo gourmet experience. Bon appetit! *Use of these tickets is limited to the day on which the exhibition is visited, and allow you see AURORA (Permanent exhibition room), too.